Port Operations and Commercial, VTS. Available only in New Orleans / Lower Mississippi area. Port Operations or VTS in the Houston, New Orleans and Seattle areas. Commercial. Used for Bridge-to-bridge communications in lower Mississippi River. Intership only. U.S. Government only - Environmental protection operations. Channel numbers, e.g. (WX1, WX2) etc. have no special significance but are often designated this way in consumer equipment. Other channel numbering schemes are also prevalent. Boaters should normally use channels listed as Non-Commercial. Channel 16 is used for calling other stations or for distress alerting. Channel 13 should be used to contact a ship when there is danger of collision. 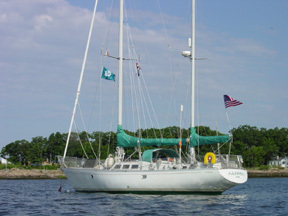 All ships of length 20m or greater are required to guard VHF channel 13, in addition to VHF channel 16, when operating within U.S. territorial waters. Users may be fined by the FCC for improper use of these channels.